River lagoons are essential in the life cycles of water dwelling wildlife and in particular steelhead. For years it has been against the law for anyone or any agency to artificially open (breach) a lagoon to the ocean. 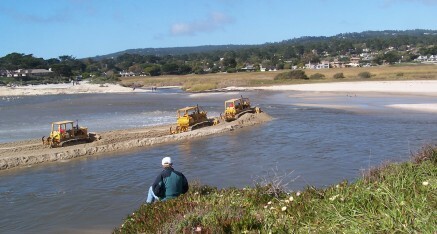 For years the County of Monterey would artificially breach the Carmel River lagoon whenever they felt it was necessary to protect property from flooding and for years CRSA complained about the practice with no success. 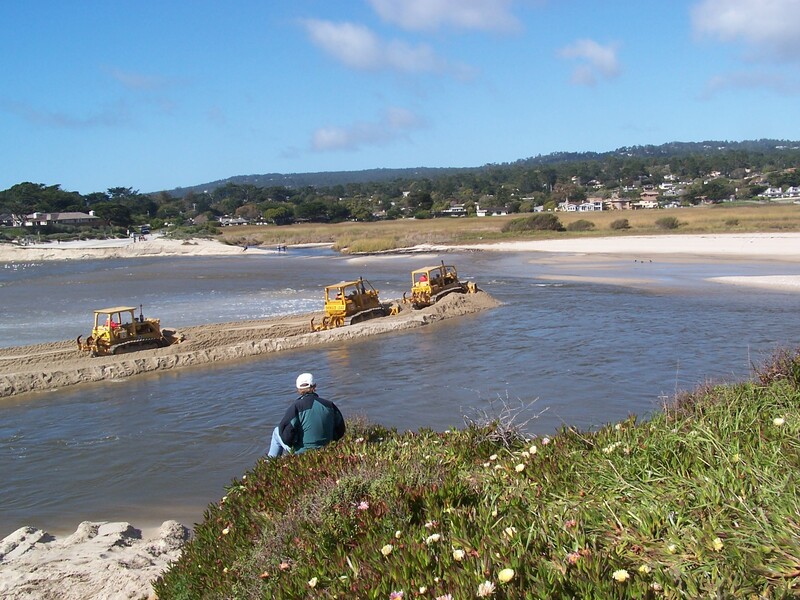 When a lagoon is artificially breached much harm is done to steelhead. Young fish are flushed out to sea before they are acclimated to salt water and habitat for steelhead is reduced as is their food supply. When the County would breach the lagoon, they would usually breach at the south end of the sandbar and straight out. That caused the lagoon to empty faster than at other breaching locations thus worsening the above mentioned problems and insuring future breaches that year would do the same. In October of 2010, CRSA filed a Notice of Intent to Sue (NOI) which was served on the county for its illegal breaching. Faced with the potential of a lawsuit for “take” under the Endangered Species Act and after several meetings between agency employees and CRSA, the County agreed to obtain all necessary permits, consult with National Marine Fisheries Service, and implement a future project to make breaching unnecessary. While the County still breaches the lagoon each year under a year-by-year emergency permit, they now are required to breach in a manner that is the least harmful to steelhead. They have to manage the breach, and also close the lagoon in spring to retain as much water as possible for summer habitat. The regulatory agencies have also notified the County that yearly “emergency breaches” will not be allowed to continue. This has started serious discussions of alternative solutions to breaching. Unfortunately, those solutions will cost a lot of money and are years away, but talks have started.